Chillers come in all sizes, from enormous, plant-sized central units that can deliver 500-plus tons of cooling per hour to plug-in portables that provide a single ton of capacity per hour. So, how do you get the one that you need? To size a chiller to meet your requirements, you’ve got to calculate the tonnage (chilling capacity) required to deliver the lowest required water temperature to your “process heat load.” That’s the sum of heat that must be removed from 1) the molded or extruded plastic, and 2) heat sources in the process equipment, based on the influence of ambient conditions. These sizing guidelines have been validated over many years of processing experience, so they should provide a reliable estimate easily and safely. And, if you have questions, don’t hesitate to ask us. Starting with materials, calculate the estimated heat loads for each factor associated with your process, then add up the results to obtain the estimated tonnage of cooling capacity required. For each material type, divide the total pounds processed per hour by the number of pounds per hour that can be processed with one ton of cooling, per the chart. For example, to injection mold PET at a rate of 300 pounds per hour, the material calculation is 300 / 45 = 6.67 tons of chilling capacity per hour. For hydraulic motors, add 0.1 ton of chiller capacity per motor hp. For feed throat, add 0.5 ton of chiller capacity. For Thermolator/Temperature control unit, add 0.2 ton of chiller capacity per motor hp. For dryer aftercooler (water-to-water only), consult manufacturer for required capacity, then add. For hot runners, add 0.15 ton of chilling capacity per kW of hot runner power consumption. 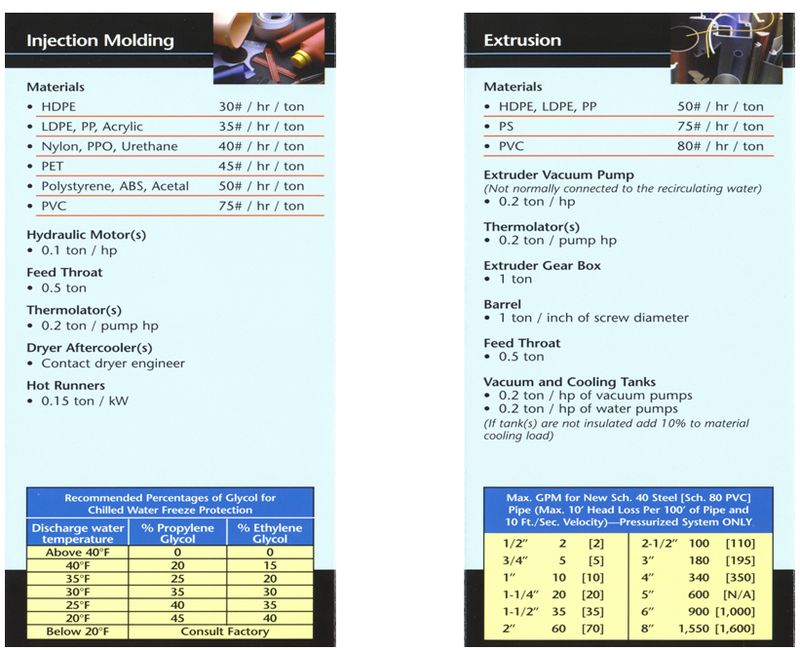 Again, starting with materials, calculate the estimated heat loads for each factor of an extrusion process using the numbers provided in the extrusion chart, then add up the results to obtain the estimated chiller tonnage required. Two other process variables: Coolant mixes and flow rates. The lower portion of these charts display information about two other important variables in the operation of a chiller system: the proportion of glycol and water needed for low-temperature coolant mixes (coolant used to deliver leaving water temperatures ≤ 40°F) and the flow rates of coolant (GPM) through common sizes of Schedule 40 steel and [Schedule 80] PVC piping. Because your chiller is likely to see a range of heat loads and cooling temperatures, be sure to size it for the highest heat load and lowest temperatures you need it to handle. And, if you’re concerned about long-term operating costs, consider a chiller with a variable-speed compressor for maximum energy efficiency in partial-load situations.